Country music has richly rewarded him over the past two decades and he honors the genre’s tradition here. The album gets off to a very traditional start with Celtic folk. The flute and skillful acoustic picking on the opener “Here Tonight” bring a Mark Knopfler tune immediately to mind. McGraw’s daughter Gracie makes a respectable vocal debut here while her dad’s familiar twangy baritone hits its groove early and remains a comforting thread through all 11 tracks. With a plethora of writing talent, each song shines in its own space while the collection maintains a cohesiveness with its simple themes and raw production. Lori McKenna’s “Humble and Kind” is as subtly effective as the rocker “California” featuring Big & Rich. The title track is a pleasantly delivered ballad highlighting many of country’s tamer clichés. He forgoes partying and loose women for the innocence of lost love, dirt roads and a beat up truck with a Hank cassette. The 40 minutes has a Keith Whitley feel. 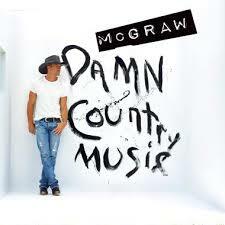 Ironically, McGraw arrived in Music City the day he died. Fast approaching 50 on last year’s “Sundown Heaven Town,” McGraw seemed to be competing with the bro country movement, incorporating rap riffs and sporting about 8% body fat to appeal to the genre’s younger, pop oriented demographic. Now only a year away from the milestone, he proves here that there’s nothing wrong with making more classically age appropriate music in a genre that has often forsaken its roots in exchange for chart position. This feels more like a throwback than a progression and it is a welcome one.